An exciting new way to produce floriculture crop seedlings and rooted cuttings (transplants) is indoors, where the environment can be controlled to produce uniform plants on demand. This growing technique enables control of the light spectrum using light-emitting diodes (LEDs) to produce plants with desired attributes such as compact growth and early or late flowering, whichever is desired. We are currently in the second year of our project supported by the American Floral Endowment. Our team of students and research technicians is performing experiments in the Controlled Environment Lighting Laboratory (CELL). We are pleased to share our results to date through a five-part series of articles in GrowerTalks magazine. 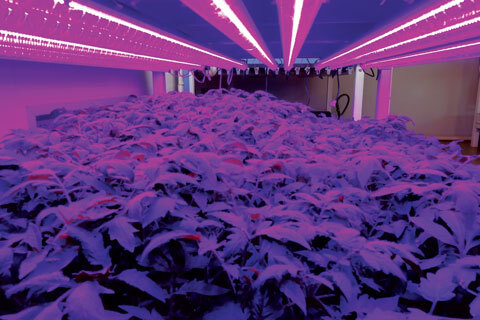 Below is a list of the article topics, and the first entitled “Lighting young plants indoors” is in the February 2019 issue. The last article will be led by Paul Fisher at the University of Florida. We thank AFE and its donors, as well as OSRAM Opto Semiconductors, OSRAM Innovation, Michigan State University’s AgBioResearch, and Floriculture Research Alliance partners and horticultural companies for supporting this research. American Floral Endowment © 2019.